Russia's Soyuz MS-07 will launch to the International Space Station in December 2017. Roscosmos cosmonaut Anton Shkaplerov and NASA astronaut Scott Tingle and JAXA astronaut Norishige Kanai will join the Expedition 54/55 crew. I think it's a coin. Normally it should be something at the back side. And I think it's not a final version of the logo design! Some features are to be corrected. But who knows what kind of device is used for the logo? Is it your design, spacepatches.nl? It is a sundial and based on one of the proposals we made for Soyuz TMA-16M (the Padalka/Kornienko/Kelly flight). It is not the final version and it has not been approved by Roscosmos yet. It is almost the final version. The final artwork will have some very minor tweaks - including a couple of extra shadows/highlights in the rings of the sun dial and a Japanese flag in which the Sun is not broken up. Working on those right now. Great design! Is it Luc who did it? And what is the description? Yes! The Sun on Japanese flag is cut in half, to be corrected. Shkaplerov replaced Skvortsov. Was it the same design for Skvortsov? He will fly in 2019 now. The crew patch is depicted in the shape of an an armillary sphere: a centuries-old tool that is supposed to represent the heavens. The Soyuz MS-07 spacecraft is shown flying high over the Earth in the center of the instrument, symbolizing man's continued presence in orbit. In the background, the Moon is shown, representing future aspiration for human activities in space. The constellation of Capricorn is represented in the top of the design, with the three larger stars representing the crew members. 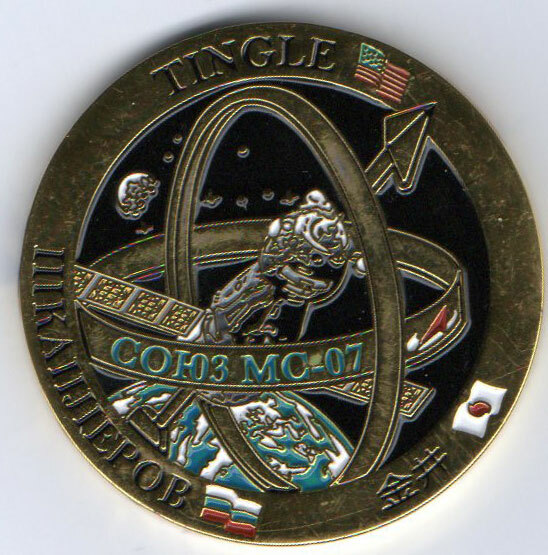 The groups of two and three smaller stars symbolize the children fathered by spacecraft commander Shkaplerov and American astronaut Tingle. The crew's names are positioned along the border of the patch together with their national flags. 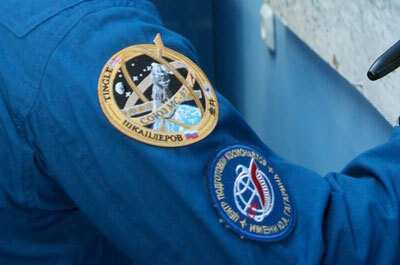 On the design's horizontal ring, the name of the spacecraft and the Roscosmos logo are shown. Designed by Luc van den Abeelen. Got information that Skvortsov, who was commander of the MS-07 crew before being replaced by Shkaplerov, had a completely different design of the crew's logo. He preferred to keep "his" design for his flight in 2019. First look at real patch at this photo. Where is the shade on the planet? And the Sun on the flag of Japan is cut in half I feel. And why only Shkaplerov has this patch? Is it a prototype? 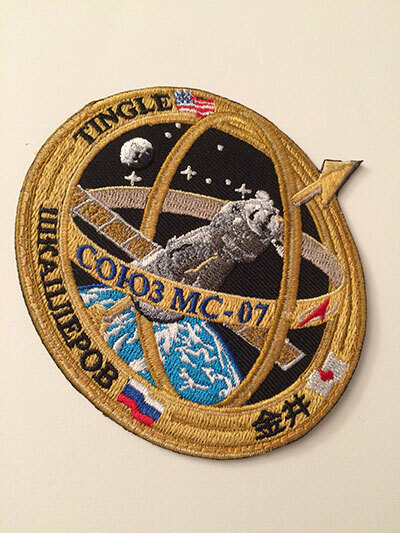 A batch of patches was produced by AB Emblem at the request of Tingle for private use — he apparently gave one of these to Shkaplerov to wear. But it looks like he did so before the artwork was officially approved by Roscosmos. 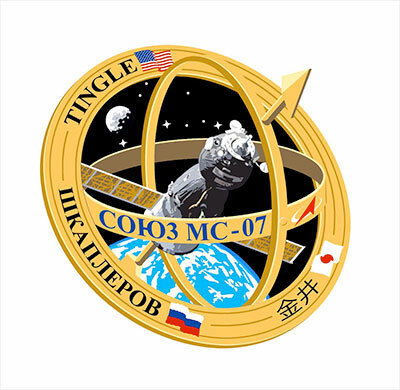 I have not seen the Tingle patch in detail, but if the Japanese flag is broken up and the limb of the Earth is missing, this must be an earlier stage of the design. Our patches were delivered to Star City, Zvezda and Kentavr earlier this month. So it was AB Emblem's prototype on Anton's shoulder. And could you put here a photo of the real patch which will be on the crew's space suits and on onboard flight suits? Anton Shkaplerov sent me this photo from Baikonur when preparing the MS-06 launch (he was back up). 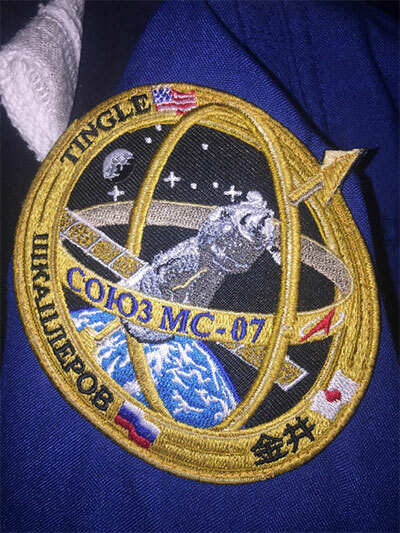 All details of this AB Emblem prototype ordered by Tingle are visible. The black space is not embroidered. Great job on the patch and challenge coin. They look great in person. 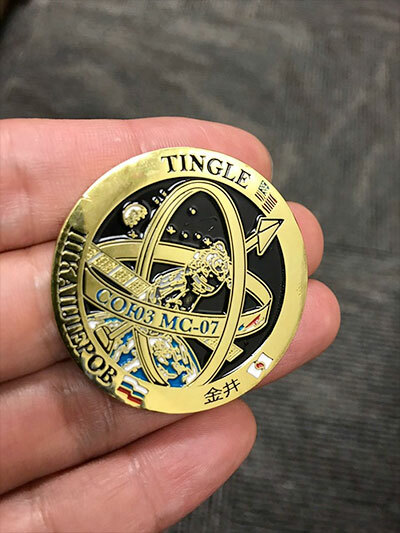 Code on the back of MS-07 is 9/17/20. 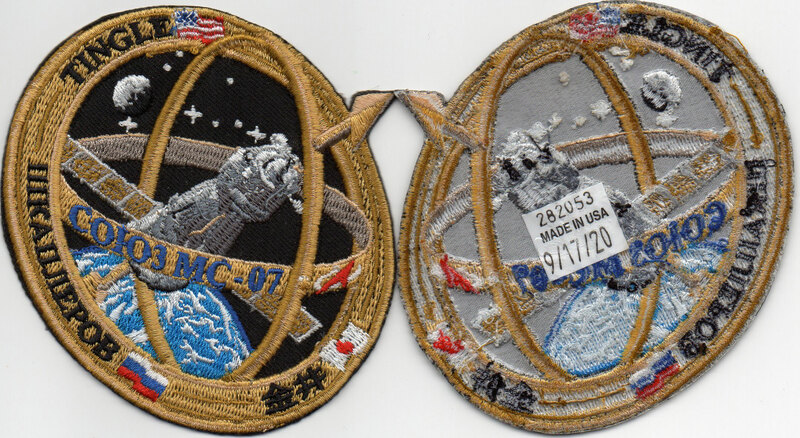 The full patch design number on this AB Emblem version of the MS-07 patch below is 282053 Made In USA 9/17/20. 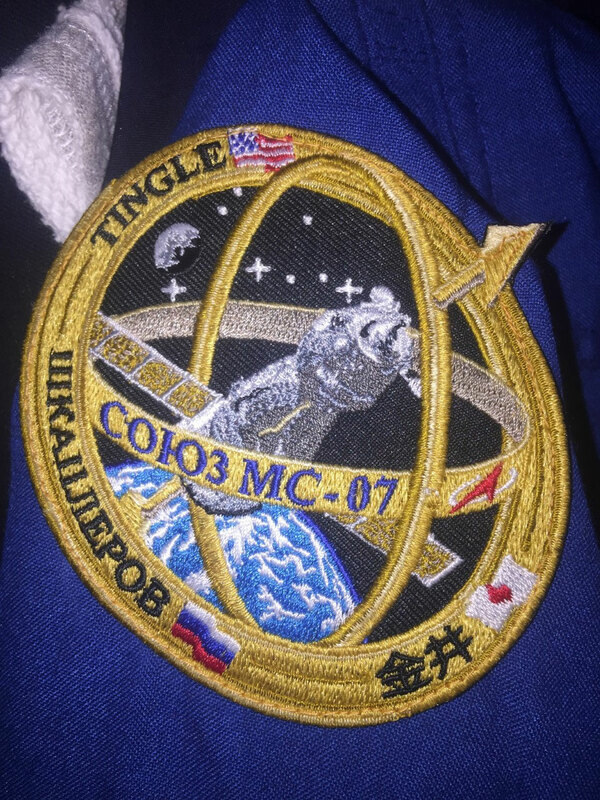 No Jacques, only the batch of possibly 50 patches produced privately by AB Emblem for astronaut Scott Tingle for his personal use are the only ones in existence. There are no plans to produce anymore unless Scott wants to do so. The AB Emblem's website is currently out of date due to Ashley Boykin being moved to another department within Conrad Industries. No one has permanently replaced her as yet in the NASA patches department. Sandy McDonald has temporally taken Ashley's place, as well as doing her own job. That is why Expedition 54, 55, CRS SpX-13 and ATK OA-8 patches have not been listed on their website for public sale. That is also why the latest production runs of the Expedition 54, 55 and ATK OA-8 patches have no embedded labels attached to them. 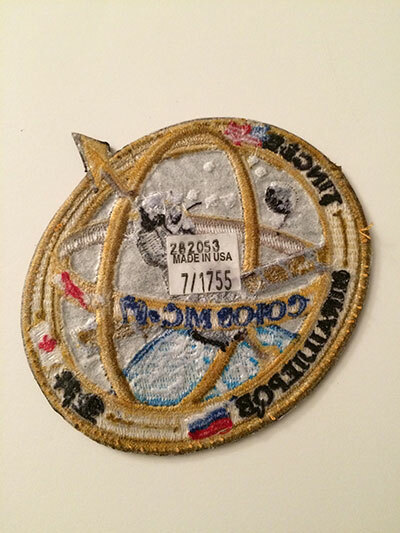 That has also happened to other patches produced from August onwards, like the ISS 4" round 15 flags patch. The cellophane packet has the label "239139 - Made In USA 1017 20 (October 2017)" on it but there are no embedded labels on the patches. Their website says that this patch has "SOLD OUT." I have quite a different information. The crew ordered 200 patches each. Are you sure that it's the AB Emblem version and not the spacepatches.nl version that the crew have 200 each of? Hopefully either Jacques and or Erik have that answer? 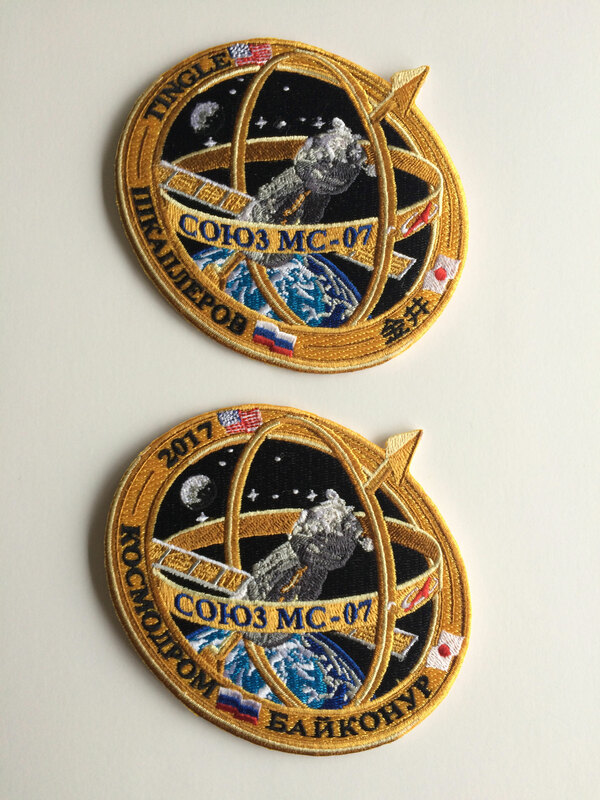 That means there could be at least 600 of these AB Emblem Soyuz MS-07 patches out there then? Yes. 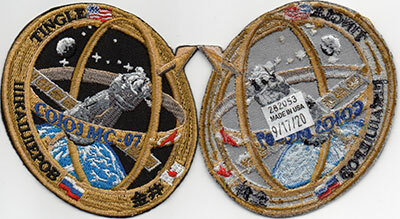 And the crew got about 250 patches by spacepatches, including patches for the back up crew. This information comes from the Star City. Flying Dutchmen! 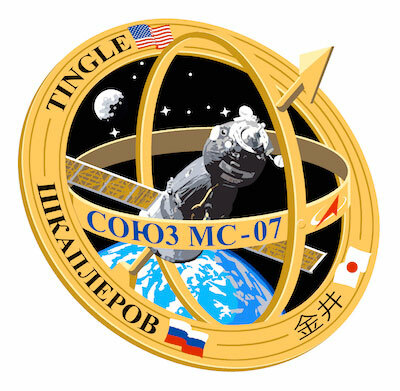 Your 36th Soyuz patch in a row is in space since yesterday. Congrats! You are strong! Thank you ...and counting, patch 37 is also ready. I got this patch from Anton. He replaced it on his training suit by a nominal spacepatches.nl patch. A super acquisition Russian. That is a patch from the "sample" batch produced in July from the 'sample machine' at Weaverville, NC. I'm looking for an example of that AB Emblem Soyuz MS-07 sample patch. Dose anybody have an example with the "55" date code?